Summer always seems like a great time to make a to-do list of projects; warmer weather and longer days are the perfect combination for getting stuff done. I had have so many half-done projects I thought I would have no problem getting them all done. 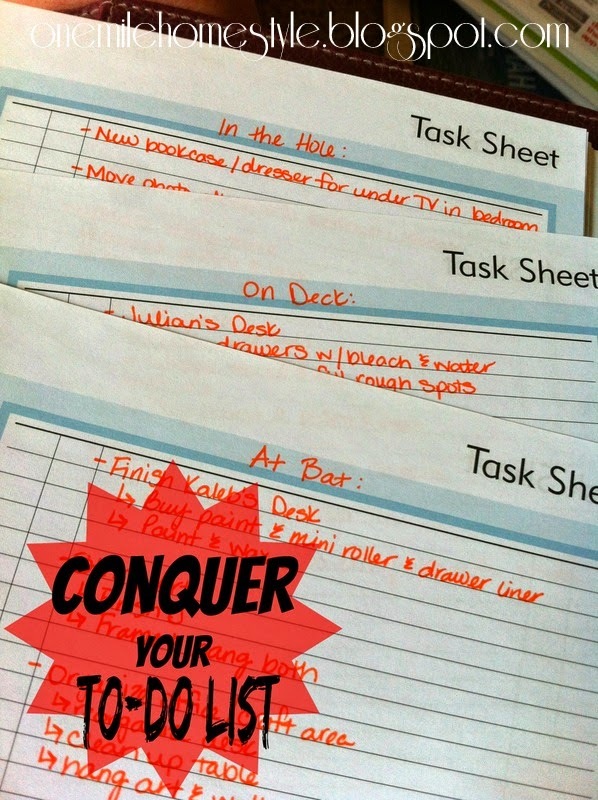 I keep a perpetual to-do list that helps me keep track of the projects that I need and want to do. But, now we are home more since baseball has wrapped up. And, to say I was feeling overwhelmed by the amount of stuff on the to-do list, that would be an understatement. Then, "Lightbulb"! (High five to whoever can name that movie.) We have been living and breathing baseball for the last few months, so using baseball to organize my to-do list was only natural. I needed a way to breakdown my to-do list into manageable and time-relative chunks. Here are the 3 categories the list has been divided into: At Bat, On Deck and In the Hole. Projects that I have all the supplies for and are almost done, or need to be done first are "At Bat", the plan is to have these done in the next couple of weeks. The upcoming projects and ones that need a little more time are "On Deck", and hopefully these will be done within a month. And last but not least, the projects that I want to get done in the next couple of months, but can wait or need more planning/supplies are "In the Hole". I am such a sucker for lists, and marking off completed projects, I love it! If you are a list maker, how to you keep your's organized? I love lists and divide them the same way. It seams we get more done when we focus on one part of the million things that need to get done. :). Great post!